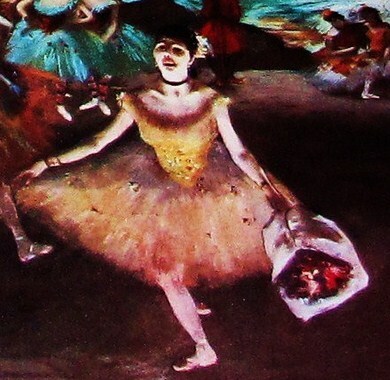 Degas was a landscape and portrait painter but he will always be best loved for his ethereal ballet dancers. The artist enjoyed spending his days sketching ballet dancers as they rehearsed. Degas asserted "Make a drawing. Start all over again. Trace it. Start it and trace it again. You must do over the same subject ten times, a hundred times. In art nothing must appear accidental even a movement." According to Art Historian, Camille Mauclair, "He gives to his groups of ballet-dancers the charming line of garlands and restores to them a harmony in the ensemble, so as to prove that he does not misjudge the charm conferred upon them by rhythm, however defective they may be individually. At other times he devotes himself to the study of their practice. In bare rooms with curtainless windows, in the cold and sad light of the boxes, he passionately draws the dancers learning their steps, reaching high bars with the tips of their toes, forcing themselves into quaint poses in order to make themselves more supple, maneuvering to the sound of a fiddle scratched by an old teacher—and he leaves us stupefied at the knowledge, the observation, the talent profusely spent on these little pictures.